WASHINGTON, Sep 13 2013 (IPS) - With state and federal government agencies investigating a U.S. farmer’s complaint that his alfalfa crop may have been contaminated by a genetically modified strain, consumer rights groups are suggesting that such reports were inevitable. The incident comes just months after similar allegations were made regarding genetically engineered (GE) wheat, a report that is still under investigation. While several strains of GE alfalfa have been approved for commercial use – unlike the modified wheat – the implications of any proven contamination could still be far-reaching. In accounts that were publicly confirmed on Wednesday, a farmer in Washington state told government officials in late August that his alfalfa crop had been rejected for export after it was found to include a genetic modification that made it resistant to certain herbicides. A spokesperson for the Washington State Department of Agriculture told IPS that results of a state-level investigation could be ready by Friday. While it is unclear which organisation carried out the original testing or how any contamination may have taken place, several countries refuse to allow the import of GE products. That has led some exporters to refuse to deal with GE crops entirely. Alfalfa is the fourth-widest grown crop in the United States, according to U.S. government figures, with exports alone valued at nearly 1.3 billion dollars last year. Following years of debate and litigation, in 2011 federal U.S. regulators allowed the largely unfettered production of GE alfalfa, though the issue remains contentious. “Based on both the government’s and industry’s negligence, this type of contamination was an inevitability – we vigorously opposed the original approval, and litigated whether it was lawful for eight years,” George Kimbrell, an attorney with the Centre for Food Safety (CFS), an advocacy group, told IPS. Starting in 2006, Kimbrell and CFS fought a series of cases against the agribusiness company Monsanto over whether U.S. regulators should be allowed to plant GE alfalfa. In 2010, the U.S. Supreme Court upheld a lower-court ban on such crops, stating that the U.S. Department of Agriculture (USDA) failed to take into account environmental risks. That decision prompted a USDA review that found that GE alfalfa genes “could be found” in non-GE alfalfa “at low levels”, and noted that the commercialisation of GE alfalfa would result in greater use of herbicides. “In December 2010, the Obama administration proposed limiting GE alfalfa to restricted planting zones to prevent contamination; however, in January 2011, under tremendous industry pressure, the [USDA] did a complete about-face and again approved the crop without protections,” according to CFS. While Monsanto seeds were implicated in the GE wheat contamination earlier this year (though the company has said it was sabotaged), its products are not involved in the Washington reports, according to a spokesperson. “The farmer was growing alfalfa purchased from another seed company, not Monsanto seed … [That company] offers GM, conventional and organic alfalfa seed products for sale,” Thomas Helscher, a Monsanto representative, said in an e-mail to IPS. Helscher also notes that the industry allows multiple levels of purity in crop seeds, while it is not yet clear which seeds the Washington farmer was using. On Thursday, a USDA spokesperson confirmed to IPS that the agency was working with Washington state to gather information on the alfalfa findings. Meanwhile, the agency is continuing to examine the report, from earlier this year, of possible contamination of non-GE wheat in neighbouring Oregon. That news prompted at least two countries to temporarily halt U.S. wheat exports. The report was particularly worrying for both government regulators and the biotech industry because GE wheat has never been cleared for commercial use, and any contamination would have come from test fields grown in the area a decade ago. Yet if that were true, it would vindicate a longstanding concern on the part of environmentalists that accidental cross-pollination between GE and non-GE crops was largely inevitable. 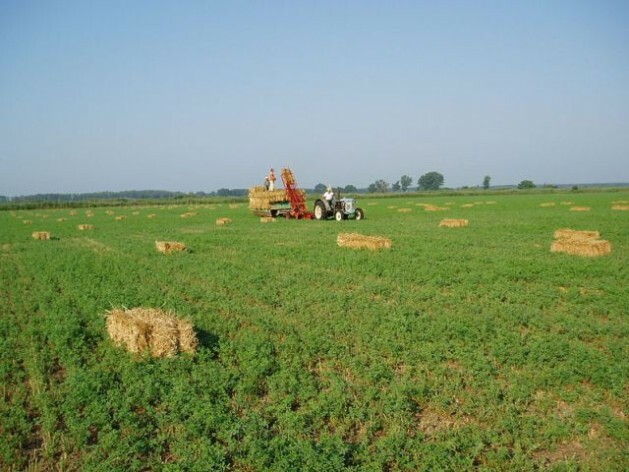 Such concerns have been particularly strong with regard to alfalfa, a perennial, bee-pollinated crop – characteristics that some say increase the likelihood of cross-breeding. Further, because alfalfa is a prime constituent of cattle fodder across the country, the potential for GE contamination worries the fast-growing organic dairy sector. Indeed, Washington state will soon be voting on a referendum to require the labelling of GE foods, part of a mounting national campaign. Major agribusiness companies, including Monsanto, are reportedly spending millions of dollars to counter that initiative. Although relatively little is known about U.S. public opinion on the broader agricultural applications of GE products, on food sources reactions are fairly clear. According a 2010 poll, just one in five people in the United States feel that genetically modified foods are safe, while a recent public comment period on whether the U.S. government should approve GE salmon garnered more than 1.8 million responses. Such findings appear to be in line with public sentiment in other countries, too. Consumers in the European Union have been repeatedly found to oppose genetically modified crops, for instance, and E.U. countries have been at the forefront of requiring the labelling of foods with GE ingredients. While legislative action on this issue has lagged in most developing countries, civil society opposition has been widely documented. Late last year, Peru and Kenya both imposed bans on the import of genetically modified foods, while Nigeria was reportedly considering following suit, citing lack of scientific consensus on the long-term impact of GE materials. In April, a decades-long push to require the labelling of foods containing genetically modified ingredients in the United States received a significant boost, when bipartisan bills on the issue were simultaneously proposed in the House and Senate. If the bills pass, the United States would join 64 other countries that have already put in place similar laws or regulations.